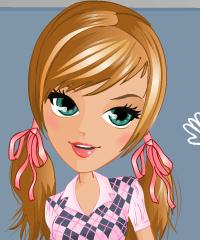 Girl School Fashion Style Dress Up and Hairstyle Game. This cute school girl wants to look trendy and cool all the time. Dress her up in a stylish and chic way. Choose the perfect hairstyle and hair color for her as well so she will look at her best. Try out different combinations and styles.